Here Susanna Brännström is sharing her story and pictures from the journey. God worked in a very concrete in people´s lifes and they left changed and with new hope. The Word became alive and spoke directli into people´s lives. These leaders got a completely new understanding for Paul and the church. The strategy is for them to go back to their churches and teach 30 new leaders who in turn will teach 30 others. There is a great need for theological training, since many have only recently become Christians and are already being put in leadership positions. We were privileged to accompany Hans Sundberg on his pastoral leadership training in Nepal. For one week focus was on Paul´s letters. It was fantastic to see how theological teaching can be filled with life and also transform lives. The last days were spent on Paul´s letters to Timothy. As Hans went through these letters, talking about the difficulties Timothy as a leader had to deal with, many could identify with that. After the teaching there was time for intercession. ”Would all those who identify with Timothy please stand up”, Hans asked. ”If you have been critisized or if you´ve met with resistance, please stand, you too,” Several people rose and God healed and restored them. We took part in praying for a woman who had been subjected to false rumours. It was wonderful to see how that burden was lifted from her and God set her free. The teaching was culturally relevant. To be present and listen to these Nepalese pastors the wall of partition that Paul is writing about in Ephesians 2:14. They had been asked what this wall can be in the Nepalese society. Suddenly one of the pastors says ”it is the caste system that seperates us one from another,” and everyone can identify with that. Paul´s teaching comes to life and up to date. It is challenging to hear how people find faith in Jesus. Most of the do that because they themselves or someone in the family have been healed. We were told one story after another how hospitals as well as witch doctors had given up and that they finally went to the Christians. The Christians guaranteed that God would heal and that is what happened. How often are we bold enough to make the same promise? We have a lot to learn from the Christians in Nepal and believe in God and that nothing is impossible to Him. Gösta Ståhl shares his experiences from his journey to Nepal. I have always had an analytical mind, also during my visit to Nepal. I landed on June 10th in Kathmandu and was very well received by some friends from the church who drove me to the hotel. On Tuesday I visited the Christian school in Kathmandu, the work consists of daycare, pre-school all the way to the senior level. It was a very positive experience, meeting all the pupils and their teachers. On Wednesday we visited the orphanages, where they take care of girls to prevent their being caught up in prostitution. Just like most people I am deeply touched by the fates of these girls and find it hard to understand that the parents don´t show any empathy for their daughters. I also visited the Bible school in Kathmandu and it was so wonderful to listen to the students describing how they were planning to work in their churches when they return home, having completed their training. Thursday: Hans Sundberg took us to Hetauda to spend a few days at the pastoral training for about 30 pastors taking part in an intensive course, teaching them what the Bible has to say to us on different issues. My reflection on my experiences in Nepal is as follows: The Christians in Nepal don´t have much to boast of in way of theological knowledge, but they have experienced God´s power to heal and restore; the holy Spirit lives in them, and they are filled with love for one another. I don´t think that they even think about different theological issues. Jesus has healed them and set them free and given them new life and that is all that matters. They don´t hesitate to tell about what God has done in their lives. Because of this my view is that what EMPOWERMENT NEPAL does is of the utmost importance: to give pastors in Nepal more knowledge of what the Bible says. 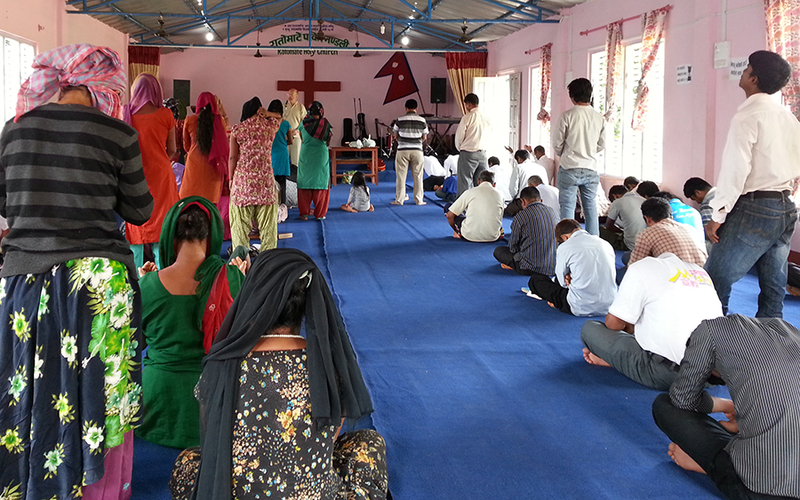 That work will mean so much for the Christian church in Nepal. Nepal is a poor country with high unemployment, my prayer is to find something to make it possible for my sisters and brothers to provide for themselves. So I will return to Nepal to investigate different possibilities. Continue to pray for Nepal and send money towards to education of their pastors. God is greater, He will do it.